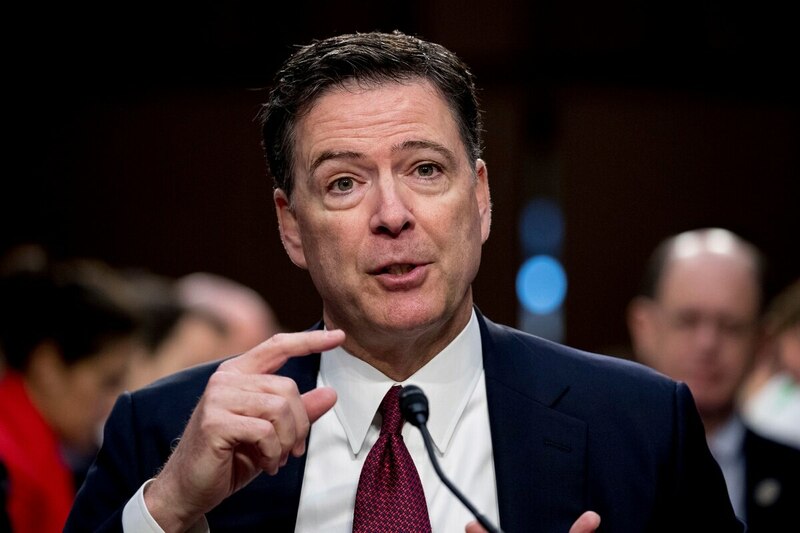 WASHINGTON — Former FBI Director James Comey asserted Thursday that President Donald Trump fired him to interfere with his investigation of Russia's role in the 2016 election and its ties to the Trump campaign. 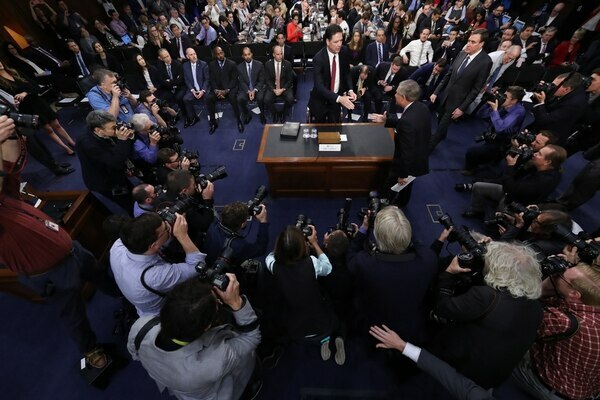 The revelations came as Comey delivered his much anticipated first public telling of his relationship with Trump, speaking at a packed Senate intelligence committee hearing that brought Washington and parts of the country to a standstill as all eyes were glued to screens showing the testimony. The former director immediately dove into the heart of the fraught political controversy around his firing and whether Trump interfered in the bureau's Russia investigation, as he elaborated on written testimony delivered Wednesday. In that testimony he had already disclosed that Trump demanded his "loyalty" and directly pushed him to "lift the cloud" of investigation by declaring publicly the president was not the target of the FBI probe into his campaign's Russia ties. Comey said that he declined to do so in large part because of the "duty to correct" that would be created if that situation changed. Comey also said in his written testimony that Trump, in a strange private encounter near the grandfather clock in the Oval Office, pushed him to end his investigation into former National Security Adviser Michael Flynn. Democratic Sen. Joe Manchin of West Virginia asked Comey the key question: "Do you believe this rises to obstruction of justice?" "I don't know. That's Bob Mueller's job to sort that out," Comey responded, referring to the newly appointed special counsel who has taken over the Justice Department's Russia investigation. In a startling disclosure, Comey revealed that after his firing he actually tried to spur the special counsel's appointment by giving one of his memos about Trump to a friend of his to release to the press. Former FBI director James Comey listens to the committee chairman at the beginning of the Senate Intelligence Committee hearing on Capitol Hill, Thursday, June 8, 2017, in Washington. Trump's private attorney, Marc Kasowitz, seized on Comey's affirmation that he told Trump he was not personally under investigation. Though Comey said he interpreted Trump's comments as a directive to shut down the Flynn investigation, Kasowitz also maintained in his written statement that Comey's testimony showed that the president "never, in form or substance, directed or suggested that Mr. Comey stop investigating anyone, including suggesting that that Mr. Comey 'let Flynn go.'" The Republican National Committee and other White House allies worked feverishly to lessen any damage from the hearing, trying to undermine Comey's credibility by issuing press releases and even ads pointing to a past instance where the FBI had had to clean up the director's testimony to Congress. Republicans and Trump's own lawyer seized on Comey's confirmation, in his written testimony, of Trump's claim that Comey had told him three times the president was not directly under investigation. Trump himself was expected to dispute Comey's claims that the president demanded loyalty and asked the FBI director to drop the investigation into Flynn, according to a person close to the president's legal team who demanded anonymity because of not being authorized to discuss legal strategy. The president has not yet publicly denied the specifics of Comey's accounts but has broadly challenged his credibility, tweeting last month Comey "better hope there are no 'tapes'" of the conversations. "Lordy, I hope there are tapes," Comey remarked at one point Thursday, suggesting such evidence would back up his account over any claims from the president. Democratic Sen. Dianne Feinstein of California asked the question that many Republicans have raised in the weeks since Comey's firing as one media leak followed another revealing Comey's claims about Trump's inappropriate interactions with him. Discussing the Oval Office meeting where Comey says Trump asked him to back off Flynn, Feinstein asked: "Why didn't you stop and say, 'Mr. President, this is wrong?'" "That's a great question," Comey said. "Maybe if I were stronger I would have. I was so stunned by the conversation I just took it in." 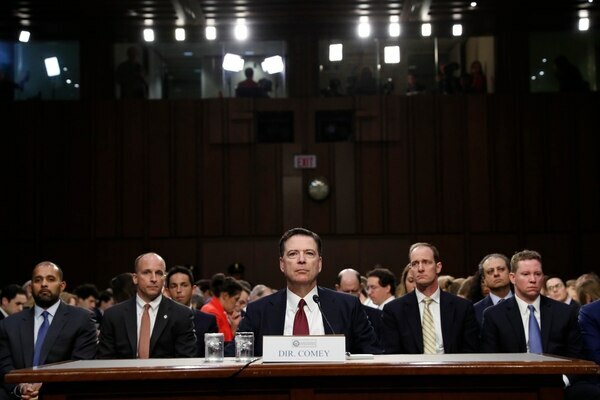 The hearing unfolded amid intense political interest, and within a remarkable political context as Comey delivered detrimental testimony about the president who fired him, a president who won election only after Comey damaged his opponent, Hillary Clinton, in the final days of the campaign. Clinton has blamed her defeat on Comey's Oct. 28 announcement that he was re-opening the investigation of her email practices. "If the election were on Oct. 27, I would be your president," Clinton said last month. Thursday's hearing included discussion of that email investigation, as Comey disclosed that then-Attorney General Loretta Lynch instructed him to refer to the issue as a "matter," not an "investigation." Former FBI director James Comey is greeted by Senate Intelligence Committee Chairman Richard Burr, R-N.C. at the beginning of the Senate Intelligence Committee hearing on Capitol Hill, Thursday, June 8, 2017, in Washington. Many Democrats still blame Comey for Clinton's loss, leading Trump to apparently believe they would applaud him for firing Comey last month. The opposite was the case as the firing created an enormous political firestorm that has stalled Trump's legislative agenda on Capitol Hill and taken over Washington. Under questioning Thursday, Comey strongly asserted the intelligence community's conclusion that Russia did indeed meddle in the 2016 election. Trump has begrudgingly accepted the U.S. intelligence assessment that Russia interfered with the election. But he has also suggested he doesn't believe it, saying Russia is a "ruse" and calling the investigation into the matter a "witch hunt."